Affordable housing isn’t a place to live. It’s a place where life can start moving forward. Center City Housing develops, owns and manages affordable housing properties for those most in need. But in truth, we’re here to help people move on with their lives. With our support, people in Duluth and around Minnesota are able to find access to stable housing and affordable rent. But we do more than put a roof over their heads, we link them to services that will help them find stability in life. View the CCHC video. NEW! Telisha Madison, a San Marco employee, received the prestigious Minnesota Job Honor Award at a Minnesota Chamber of Commerce event in Brooklyn Park on May 9th. 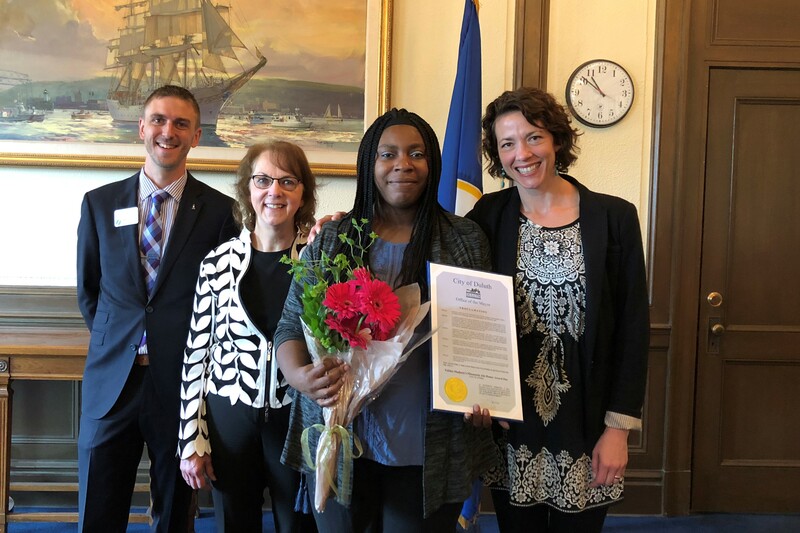 The award aims at recognizing Minnesotans who have overcome the barriers in achieving successful employment after living through dire situations. Madison was chosen from a wide range of state-wide nominees, all of whom have overcome barriers to employment. After growing up in a succession of foster homes while her mother was in prison, Madison overcame poverty and homelessness with her determination and hard work to build a successful career with Center City Housing. She is a critical member of our staff and we are lucky to have her as an employee! Click below to see her story.